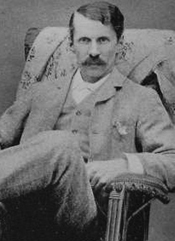 Considered one of England’s finest genre and animal painters, Charles Burton Barber was to achieve great success during his lifetime. By the age of 18, Barber was in London studying at the Academy Schools. In 1864 he obtained a silver medal for drawing from the antique and in 1866 he exhibited his first work at the Royal Academy (RA) while living in Notting Hill. 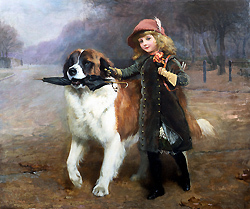 Barber became a highly sought after artist and in the early 1870’s Queen Victoria commissioned him to paint her favorite dogs. In 1883, the year Off to School was painted, he was elected a member of the Royal Institute of Painters. In 1894 Barber received a commission to paint Queen Victoria in her pony-carriage surrounded by her grandchildren. This would be his final commission as he passed away soon afterwards. Many of Barber’s paintings were engraved and he was a frequent exhibitor at the Royal Academy; Royal Institute of Oil Painters; Walker Art Gallery; Manchester City Art Gallery and the Fine Art Society.